Diversity and inclusion are core values at the University of Dayton, but bringing together people from different national, racial, and religious backgrounds sometimes can be difficult, even in a welcoming community. 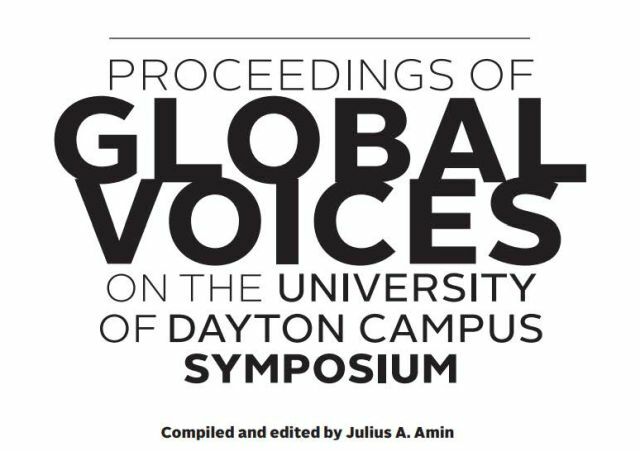 At the symposium Global Voices on the University of Dayton Campus, held Jan. 23-25, 2018, the Alumni Chair in the Humanities invited students, faculty, and staff from all parts of the globe to share stories about their experiences at home and on campus, in hopes of strengthening the University’s inclusive excellence. Additional support came from the University of Dayton Speaker Series; the College of Arts and Sciences; the departments of English, History, Philosophy, and Religious Studies; and the International Studies Program. This series includes the proceedings from the symposium as well as the materials used to promote it.